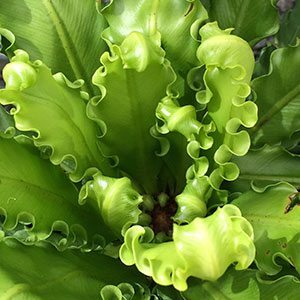 A very attractive Birds’s Nest Fern, Asplenium Osaka makes an excellent garden plant as well as a good indoor plant. Characterised by the undulating or ripples leaf margins the new foliage is a lime to mid green. Mature well kept specimens are some of the most attractive fern varieties in cultivation. Although Asplenium Osaka comes from tropical to sub tropical climates, it does grow well in cooler climates. This is a fern that makes a very good feature plant. It looks great when given room to form its natural rounded shape. Individual fronds can reach 1 metre in length on a mature plant, so space for growth is important. Grow it it a container in a shaded courtyard as a feature. Plant it near a water feature, or use it as an indoor plant. Asplenium Osaka requires light shade or good filtered light for optimum performance. A well drained humus rich soil is important, as is good drainage. During summer, misting to provide a little extra humidity will all be beneficial. Longterm exposure to temperatures below 13C is problematical. So in colder climates growing this wonderful fern in a container and overwintering indoors is the answer. During active growth, regular applications of a liquid seaweed fertiliser will be beneficial. If you are growing Asplenium Osaka in a container, you will need to repot it every 2 -3 years. This is to allow for natural growth as well as to renew some of the potting medium. Repotting is best carried out in early spring. Pruning is generally not required except for the removal of dead foliage. Propagation is usually from spores and this is a difficult for process for most gardeners.